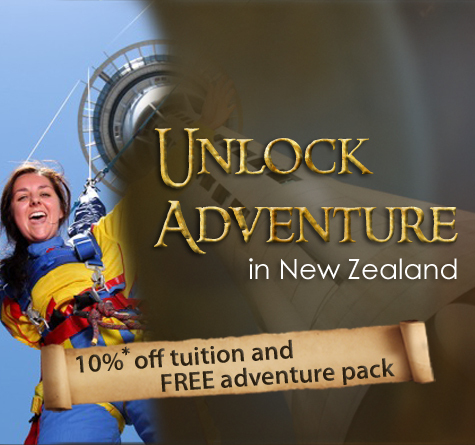 Kaplan International Colleges is inviting students to push themselves to the limit with an adventure package in New Zealand. Can you imagine learning English and improving your language skills during the day, then living the life of a Hollywood stuntman in the afternoon? Don’t just dream it. Live the adventure with Kaplan. Language school students can enjoy the experience of a lifetime while studying English in Auckland with electrifying activities such as jet-boating, base-jumping and bridge climbing. Auckland was recently named one of the world’s ten most liveable cities and with amazing forests, beautiful wild islands and a bustling city center there is really something for everyone in this Oceanic paradise. Ensure that you book before December 31, 2012 to benefit from the wide range of savings available for this once in a lifetime English learning adventure packing.